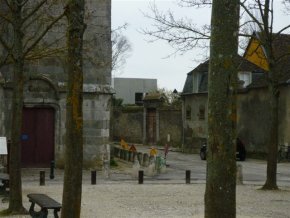 12/3/11 – Heritage – Provins – We receive information concerning threats to heritage landmarks almost every day but, unfortunately we cannot possibly study them all. This news item is meant to simply put out an alert about yet another example of vandalism, a critical subject which we continue to point out and which needs no further comment. 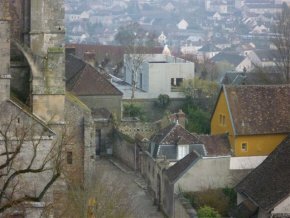 Provins is a medieval city, theoretically protected by the designation of a sector listed as one of the Unesco World Heritage Sites. Readers might recall that this international body recently summoned France to respect its commitment to protect this city . At the time, the issue was the change of ZPPAUP authorizing the construction of houses in areas which were supposed to be off limlits. 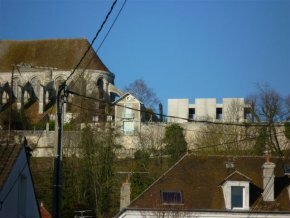 We wonder what Unesco will say today on finding out about the wart which has just appeared inside the Provins lycée, itself also a listed historical monument (originally the Palace of the Counts of Champagne) and which is difficult to ignore. This time, the mayor of Provins, Christian Jacob, is in no way responsible. He claims to have discovered the affair at the same time as the residents. 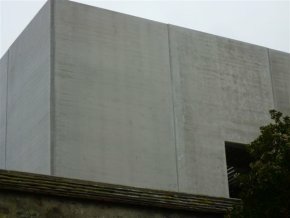 A few days ago, he called for a meeting on the site with the president of the Conseil regional d’Ile-de-France, Jean-Paul Huchon, which manages the lycée ; the prefect ; the architect for Bâtiments de France, Marie-Christine Roy-Parmentier and the chief architect for historical monuments, Paul Prunet. Work was immediately stopped. We had pointed out this summons in this article in French. We also tried to reach the architect of the Bâtiments de France, but the operators at the Service Départemental de l’Architecture et du Patrimoine for Seine-et-Marne are only available three hours in the morning (!) and thus heard only a recorded message.